I'm so so so excited for Fall - and all the baking to come, of course. Although it's not officially Fall just yet, I'm easing my way in with a super delicious (pumpkin filled) breakfast post - to come within the next couple of days. 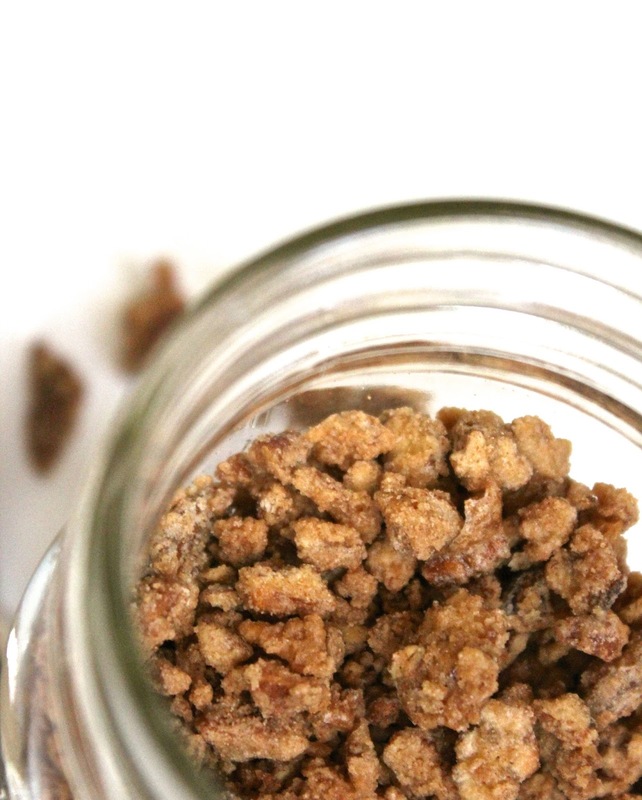 I figured I'd start with these Simple Candied Pecans - they're the garnish on that upcoming breakfast post. But honestly, they're good on just about anything. I've been eating the extras on everything from my vanilla ice cream to my raspberry vinaigrette salads. They add such a unique flavor to every dish! And of course, they're delicious by themselves. Wouldn't a jar of these pecans make such a cute little gift, too?! 2. Bring the sugars, water, vanilla, & cinnamon to a boil. 3. Reduce the heat slightly and add the chopped pecans. 4. Continue to stir the pecans in the syrup until the liquid evaporates. 5. Once the sugar crystallizes (and is no longer wet/syrupy) turn off the heat. 6. Place the pecans on a parchment lined baking sheet to cool.